Linda I really can’t thank you enough for creating such a beautiful baptism gown from my wedding dress – you are so truly talented.” Amy Derham. “Thank you for creating Daniel’s christening gown & romper from my wedding dress. It’s beautiful & very special.” Claire. 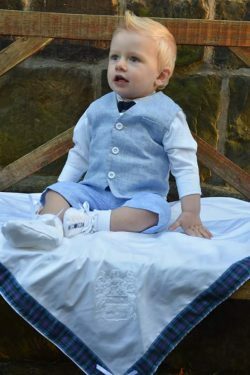 “Thank you for Connor’s amazing Christening outfit! Love love love.” Tara Peat. The dress came this morning!! It is absolutely beautiful! Thank you so much. It fits her perfectly and the embroidery is so pretty. I can't believe its finally here! Will send a picture after the baptism. Thank you again!! I have just called but you were out. Oh My Word!!! It is all absolutely stunning!!! I am overwhelmed to be honest and reduced to tears!!! The detail and all the hard work you have put in really shows and its just amazing!! I can't wait for Hayden to wear it. I will send you lots of pictures! LOVE the booties!! So cute!! And the embroidery on the bib and handkerchief....so fine and beautiful!! I cannot thank you enough!! Just amazing!! The christening gown has arrived here safely. Thank you so much for your restoration work which has surpassed all expectation; I am so delighted with it that I just have to keep looking at it as I can hardly believe it is the same gown I sent to you. It was dull and grey and I didn’t imagine that you would be able to remove all those rust spots so successfully. The repair work on the various holes and torn lace is immaculate and looks as good as new. I shall be happy to recommend you to anyone else who may be contemplating having such a garment restored and I shall cherish this gown by treating it with great care in future. Gown is in our home. THANK YOU!!!! It is so, beautiful, I have no words to describe my feelings when I look at this gown. Thank you. I will write you more about it after baptism. Thank you so much once again. Regards, Vesna. Thank you very much for the work you carried out on my family christening gown recently: your neat little stitches and repairs together with the delicate cleaning have transformed it. I'm sure my niece will be thrilled. The gown/romper is just divine AND exactly what I had hoped it would be. I cannot wait for Sunday to show my little man ans his beautiful outfit off. I am so grateful that you squeezed us in at such short notice. I would just like to say that your christening gown is magnificent and we are very, very pleased. If you need any tesitimonials then please let me know ! What a transformaton! The colour is now white and your work is amazing. I am totally delighted and will be forever grateful to you for your expert dedication to our precious family gown. The Christening is in May so the gown will be definitely used as intended. So we are thrilled by your rescue and that miraculous strengthening. Thank you so much for the beautiful romper. It fits Jonny perfectly! The gown is beautiful. Thank you so much. Just to let you know the gown has arrived safely. Oh my goodness - I can't believe how beautiful it looks, you have woirked a miracle and I was quite choked when I saw it. I can't wait to take it to my mum's at the weekend - I think she is very likely to have a little weep! I really can't thank you enough, and will send the balance of the payment tomorrow. Thanks again, I know it was a challenge! Received Lachlann's romper today - looks super. We are really pleased. We haven't tried it on him yet! Happy Xmas from Rona, Kevin and Lachlann. Thank you again for such a wonderful job. My mother saw the romper tonight and her jaw absolutely dropped. She said "That is the sort of thing you get framed after the Christening," and she could not believe how beautifully you sew. God has given you a talent. I received the gown this morning - you have done a terrific jobon the repair, it looks fantastic and the cuffs are lovely. beautiful. We can't wait to get down there to see it for ourselves. Just arrived home and excitingly opened the box. Everything is absolutely gorgeous! We loved the gown and the embroidery is such a lovely idea.The shawl, shoes and bonnet make it! i amso pleased we decided to have the bonnet, its so cute! Thank you again for all your hard work, its amazing how you did the embroidery, and it has been a pleasure to arrange this with you. We are thrilled with the work you have dones so skillfully on the gown and the new petticoat. kind regards. A short note to express my thanks for the restoration work done on the family's gown. When I posted it to you, I did not believe it could be saved! It looks beautiful and is now truly a family heirloom. I shall definitely recommend Little Doves to family and friends. Thank you very much for restoring our Christening Gown. We were all very pleased with your intense work and such high standard. The baptism went very well. Thank you. 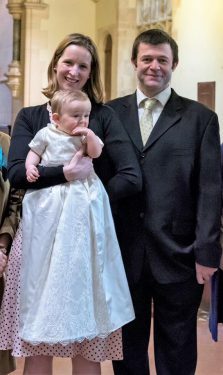 Many thanks for such a beautiful repair to our family christening gown - it is superb. Many thanks for creating such a beautiful heirloom gown for Amelia. It's absolutely lovely. Thank you. Thanks ever so much for the romper. It's absolutely gorgeous and a perfect fit. I can't wait for next Sunday to show him off in it! Will e-mail you a picture. Thanks once again and take care. The gown arrived today and it is absolutely fantastic. It is exactly like I wanted it to be. It is clear that you have taken the time to look at all the details - I know because, as I believe you have already found out, I am a bit of a perfectionist. Thank you very much for making it and for doing such a great job. Thank you so much for your wonderful work and enthusiasm in creating a dream dress for Amy. Obviously we have been kept up-to-date and I think the whole thing has been a lovely experience for all of us. We are very excited and are looking forward immensely to seeing Amy in her dress on Sunday. Just a little note to thank you most sincerely for Rohan's beautiful christening romper. We enjoyed a lovely day in the sunshine, following his baptism in the local church. He looked fabulous, and we are truly grateful. Thanks once again, best wishes. Many, many thanks for the fantastic job you made on my Christening Gown. I can't believe it's so white! I sent a digital picture to my parents in South Africa - it was originally part of my mother's wedding dress - and they are thrilled with the results. My mum really thought it would fall apart if anyone tried to repair and clean it. Once again, many thanks. Just a note to thank you for the excellent Christening outfit for Joshua - he looked beautiful on the day and everyones commented on his outfit. Thanks for all your hard work and last minute attention to detail, it was very much appreciated. Here's a little piece of christening cake for you as well! Having searched the shops to find a suitable outfit for my youngest son to wear on his baptism day, I was close to despair! Nothing I found was appropriate! Either it had too many frills, and looked very girly, or it was too plain or the fabric was not of a good enough quality. Where could I find something suitable for my baby boy? The personal service I received from Linda was fantastic- she came to my house to discuss my ideas, was able to show me some samples of her work (which is of the highest quality), and together we planned a unique outfit for my son to wear on his christening day. What made it even more special was the fabric that the outfit was made from! Linda cut the train from my wedding gown, to make a very special romper for my little boy. On the special day, my son looked gorgeous, he was wearing a hand made unique gown, which had been designed just for him. With a matching hand embroidered bib, he really looked a picture. His suit is now carefully packed away, and is sure to be a family heirloom! Thank you for a lovely Christening outfit for Benjamin. It fitted lovely on the day and he looked gorgeous. We had a good day – Benjamin was a picture and the service was lovely.I specially loved the hat, it really finished the outfit off. 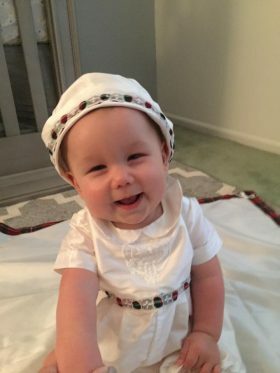 After seeing samples of your work, I could trust only you to use the skirt of my beloved wedding gown to create a unique Christening outfit for my son Thomas. I appreciate the time you took to listen to our design ideas to create a romper/ gown with a detachable skirt, to embroider our family clan crest onto the bodice and incorporate some of our clan tartan ribbon. The outfit you created for Thomas was exquisite and is truly a family heirloom that will be used for generations to come. When we decided to baptise Henry when he was a year old, I really was in a quandary on what he should wear. I didn’t want a babyish outfit but something more fitting his age. The waistcoat that you created was just perfect. It was fun, cheerful and very special, the little bowtie was just right too. A great day, many thanks. What a lovely surprise when I opened the parcel this morning and looked for the first time at the finished romper. I knew that it would look good but I never thought it would be as stunning. 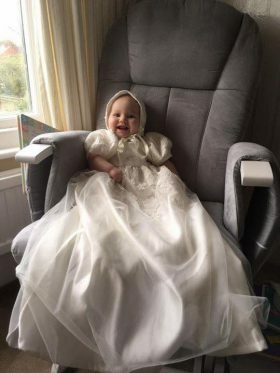 My wedding dress was special to me, and is more so now that you have turned it into the christening outfit for my son. Many thanks for this, it is perfect.